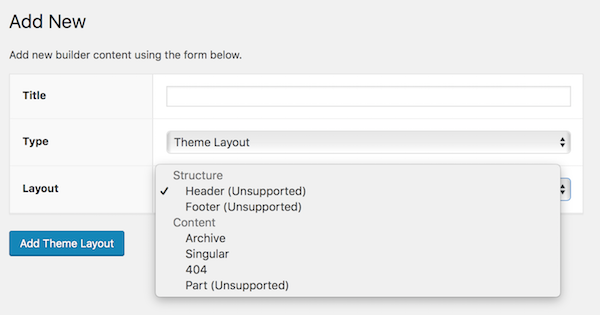 Most themes support archive, singular, and 404 layouts. However, to support the Beaver Themer header, footer, and part layouts, themes must be built a certain way. Full-width theme layouts are supported. Note: There has been an issue in which sticky, shrink, and overlay header options in Beaver Themer don't work with the Storefront theme. If you have any problem with Beaver Themer compatibility with these themes, contact the Beaver Builder Support team by clicking the link in the top menu. A free bare-bones theme for experienced WordPress users specifically designed to be used together with Beaver Themer for layouts. If you have a problem with Beaver Themer compatibility with these themes, contact the theme developer. If you have coding skills, you can add custom support for header, footer, and parts layouts for other themes with some PHP code, as described in the linked article. Note: For full theme support, your theme must allow its header, footer, and parts to be removed using hooks.